Lake Chabot is 92% FULL! We are expecting a few nice days this upcoming week, temperatures are expected to be in the 70’s. Catfishing has remained fairly steady, while bass fishing is slowly getting better and better. Water temperature remains in the low 60’s and water clarity is about 6 feet. 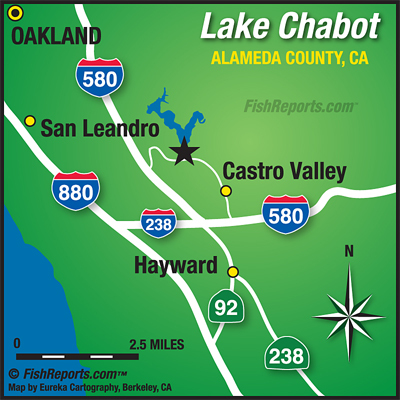 EBRPD is done with catfish plants for the year and are planting rainbow trout again. Our last plant was on October 12th and the next plant will be the week of October 30th. Several catfish were reported caught this past week. Ken Kruse of San Lorenzo continues to catch two to three catfish, fishing near the island using mackerel. Typically, catfishing should be pretty good this time of the year. When fishing for catfish, the best bait to use is either chicken liver or mackerel. Make sure to cut a 2” inch chunk of mackerel and put it on a size 1 or 2 hook and a half ounce weight works best. A simple trick to use when using this bait is wrapping magic thread around the bait to ensure that it doesn’t fly off when casting. Typical hotspot for catfishing is fishing near the Island and back by Raccoon Point. We are going to have a good trout season. Anglers have been catching a few trout, trolling near the dam. EBRPD planted 750 lbs. of trout over by Coots landing on October 12th; another plant is scheduled the week of October 30th. Trolling back by the dam using a pink flicker shad has been successful these last couple weeks. With high water level this year, trout fishing should be better in the next couple weeks. Please call the marina or message us at our Facebook page at the end of the day for the most up to date fishing conditions. Bass fishing has picked up quite a bit. Many anglers are using plastic worms to catch bass. There have been an abundance of smaller size bass (1 to 2 lbs.) being caught all over the lake. Senkos have been the most popular bait to use. Currently hot spots are over by the Island, Raccoon Point, and Alder Point. Please practice catch and release for bass, as they are not stocked into the lake and their population depends on you! 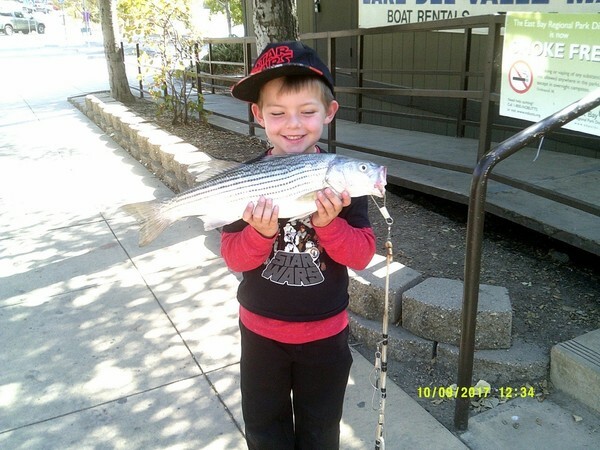 Though not a ‘Featured Angler’, these Angels were seen from Lake Chabot Marina during Fleet Week!